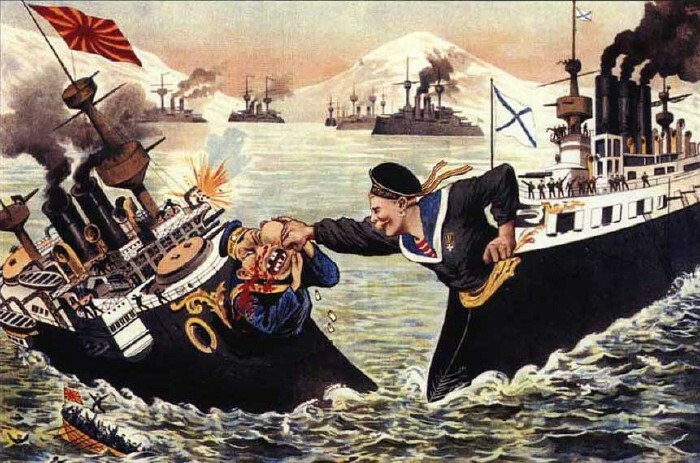 In the beginning of 20-th century Russia participated in the war with Japan. 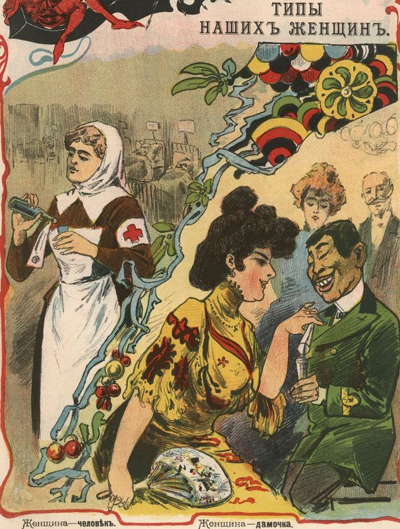 Some our readers asked if there were some propaganda posters from that times. This one shows how Russian soldiers eat Japanese ones for a breakfast. It was called “Russian Breakfast”. 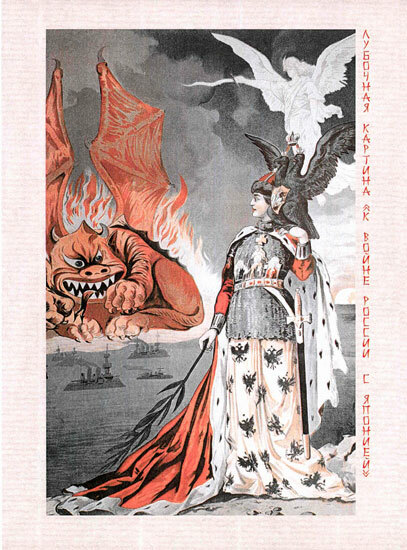 Japan here is shown like a winged-monster and Russia is like a woman-fighter. Here there is a Russian soldier sitting and showing with all himself that small Japanese guys cannot do him any harm. Especially taking in the account his Big Gun. Russian Navy hits Japan Navy. In Russia women cure man, in Japan women only excite lust in men. on a 3rd picture Japan is simply presented as dragon. And on 4th Japan is of course manipulated by fat British, tall American capitalists, isn’t it??? And what nation does the small man in the lower right corner, dressed in yellow represent? I woul assume he represents China. The american and british jews provoke that little guy. They such pity. i think you are right.!! LOL the writing on the standards in the 5th picture looks like moon people writing, you can tell they had no idea how to draw kana. Yes because I’m sure the important message in this poster would have been the accuracy of the Japanese language. It’s made for Russian nationals, why do they care/know what the hell authentic kana is or looks like? awwww are you a japanese nationalist? dont you just love your lil anime and katanas? 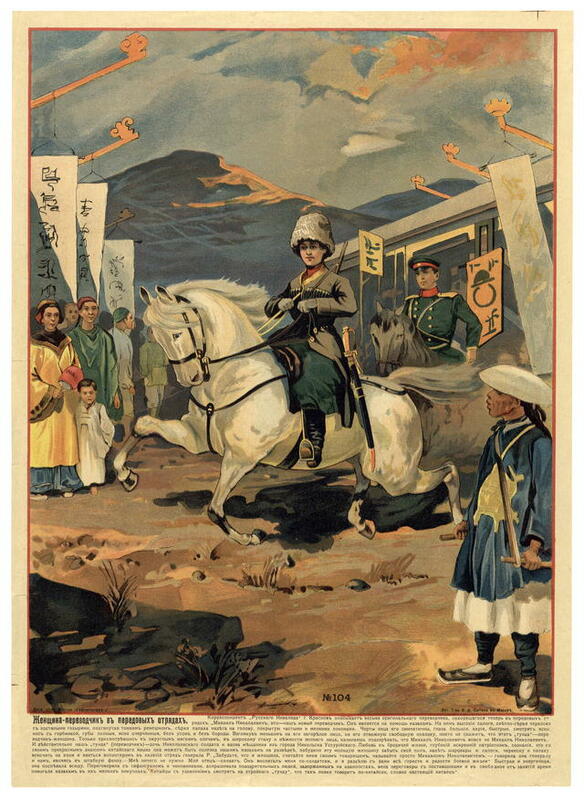 What posters were put out after the Japanese won? @ mac605 I think that is china. If so, poor China. They look worse than Japanese! That defeat was a huge loss of face for Russia, because that racial stereotyping was widely believed. 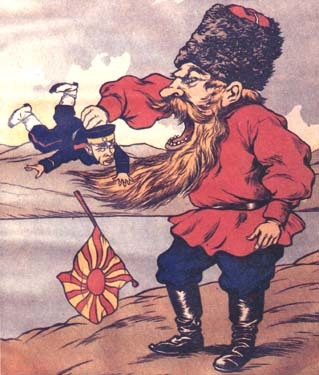 That belief held that Asians were racially inferior, and therefore not capable of defeating ‘Western’ nations millitarily – that’s why the Japanese are pictured as being puppets of Western captialists, how else could they wage a war on Russia all by themselves? The USA was the only Ally country that joined in the end of the war. The USSR has fought since 1941, and 70% of German troops were stationed on the east front. The US has met least resistance and least casualties, while also having most money, the strongest economy and the most powerful industry from the very beginning. Funny how you say the US joined at the end of the war as if we made no effort .. It ended so quick because of us.. Imagine the outcome had the US not joined in to help stomp the Nazis. You might be speaking german today. Just think about that before you go slinging mud in our face. Remember, the Germans weren’t invading america but we still came over and helped protect our neighbors, but as usual… nobody thinks about the good things we do. Sorry man, but he’s right. The USSR lost like 10 million people in WWII – and they have a population smaller than the US. I don’t know if they still do this but Russian weddings used to have a part in the ceremony about the losses in WWII, which they call the great war for liberation or something like that. The Nazis collapsed primarily due to lack of resources to sustain their land grabs, as what resources they had were used fighting the Russians. The Russians kept them out of the Caspian oil fields, which made a huge, huge difference. Wrong war, gents. These are from the Russo-Japanese war of 1904-1905. Hey Entombed, hate to be a net ‘troll’, but what you wrote isn’t exactly true. 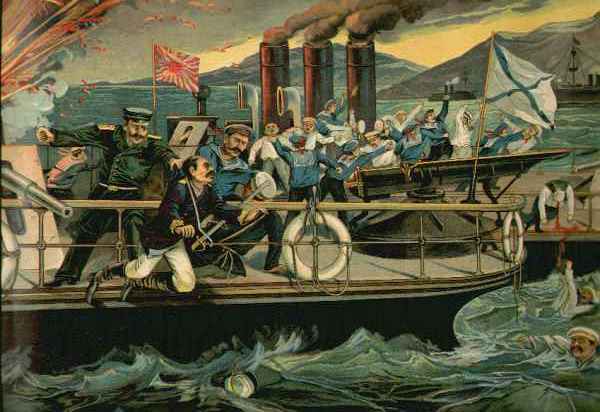 For one thing Port Arthur held out for about nine months and cost the Japanese enormous casualties. 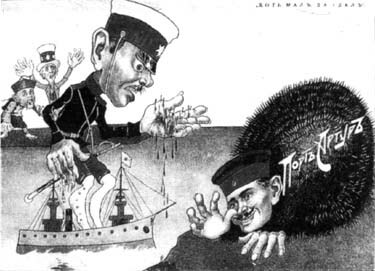 For another Admiral Von Essen’s cruiser squadron from Vladivostok preyed heavily on Japanese merchant/supply shipping, causing the Japanese some serious worries. Finally, although the Japanese won the major land battles at the Yalu, Liaoyang, and Mukden, they were not decisive wins. The ‘knock out blow’ they were looking for never happened. In fact a major reason Russia got such a favorable bargain at the Portsmouth peace accords was because the Japanese were running out of men and money and substantial Russian reinforcements were finally starting to arrive in Manchuria. That’s right. Japan was the poster child for limited resources. The japanese were better equipped primarily due to western powers. 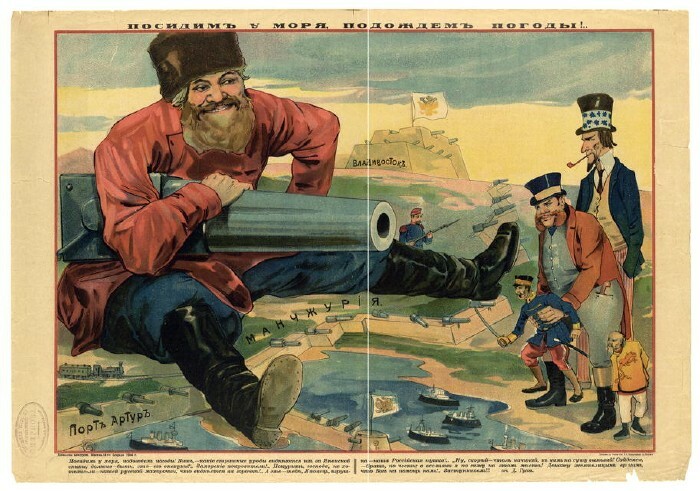 I like the fourth one best where russia is depicted as this giant with a huge cannon and england/us/china are supporting the japanese in the war. Nice and funny post. But it proves the reality! !